One of the best things about spring is the abundance of beautiful dresses. And when you can find styles that not only look great on your body, but happen to be terrific bargains in the process, go for it! The good news: For women over 50, there are a myriad of dress options for Spring 2017. Look for vibrant colors, florals, prints, stripes, dots and lace. Dresses are, in fact, the perfect wardrobe essential simply because they are so easy to wear. Throw one on in the morning, grab an accessory or two and you can go effortlessly from day to night. This is the very essence of spring time dressing –easy and comfortable. Selecting the ultimate spring dress revolves around choosing a style that best suits your body type. Don’t be afraid to try styles that you’ve never worn before. Experimenting can give you a whole new look. Remember, when you find that perfect dress, you’ll want to wear it again and again. Here, from NorthStyle, are five “must-have” dresses for under $80! Dresses are available in sizes 4-18 or SM to 3X. At these price points, why not splurge a little and indulge yourself? Dressing up has never been so much fun. Shirtdresses never go out of style. And for good reason. This style flatters a variety of body shapes, with a fitted silhouette that accentuates curves and a softly draped hem that conceals flaws. 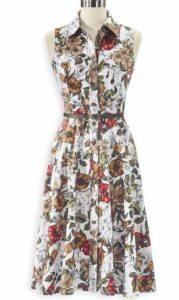 A classic design, the shirtdress looks modern with a touch of spandex in an artistic floral print. Note the button front style is slightly gathered at the waist and accented with a belt. Front and back bodice seams provide additional shaping, which enhances the overall appeal. Maxi dresses are the most forgiving of all dresses. A wardrobe staple, the long and flowing lines reflect the ease of warm-weather dressing. Just add shoes and jewelry and voila, you have an outfit that can go anywhere. The draped tie accents and shapes the waist. Proportion is key. Pair with sandals, flip flops or wedge heels to keep the look casual and relaxed. By day, maxi dresses look totally chic when worn as a beach cover-up. (There are, after all, advantages to full body coverage –even at the beach!) By night, layer with a shrug or a shawl and enjoy a night on the town. Flattering to women of all heights and body shapes, the fit-and-flare dress is adored by women everywhere. This season, choose from vivid colors, vibrant prints and geometric designs. Nipped at the waist, the fit-and-flare creates a slimming silhouette, while the little flounces on the bottom forgive a multitude of sins. Stylists across the country agree: This style looks good on just about everyone! Dress up or down; wear day or night. No wonder it’s beloved by all. Comfort and fashion merge together in one with the classic sheath dress. Sporting a dark floral print, the sheath captures the essence of spring with vibrant shades of blue and green. The deceptively simple silhouette works wonders for petite and short figures as it elongates the torso. In terms of dress length, knee-length or slightly above the knee looks best. Colorblock dresses sport bursts of color with clean lines that magically slim and contour one’s body. Bold bands in three colors catch the eye and flatter the figure. Pair with pumps or sandals for a dress that carries you throughout the day with effortless style. Wear to work, out-to-dinner or even a daytime wedding. The possibilities are endless. Barry Schwartz serves as Vice President General Merchandise Manager at Potpourri Group, a leading internet and catalog retailer. Barry oversees the buying, brand strategy and product development for NorthStyle, Serengeti Fashions and The Pyramid Collection. Originally from Randolph, MA, Barry attended Boston University Questrom School of Business. He resides in Boston.